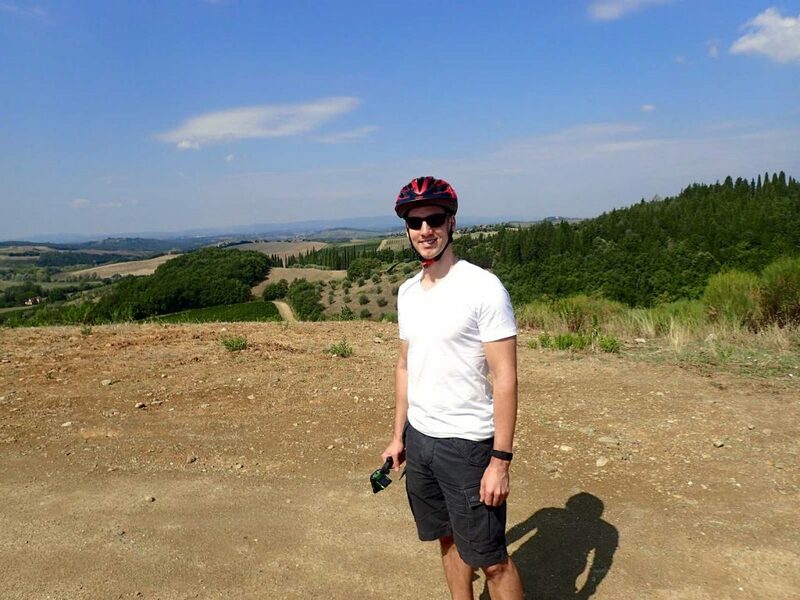 Cycling and wine tasting in the Tuscan countryside is like soaring through time with the wind in your hair and a ‘bouquet’ under your nose. 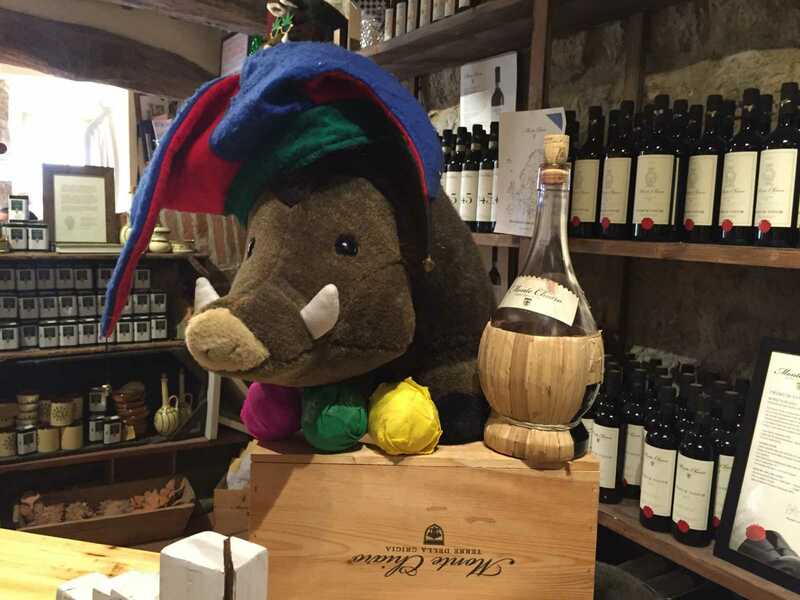 Only in Tuscany can you indulge in tradition, heritage, and the quality of the land which is still producing wines once enjoyed by the likes of Michelangelo, Leonardo Da Vinci and Raphael. And now, Rob and Bryan! We booked the day tour with Bike in Florence, led by native Florentine, Piero Didona. Piero ran a bike shop for 20 years and stopped “because it wasn’t fun anymore” and now spends his days guiding people around Tuscany. He’s the kind of guy who has it all figured out! 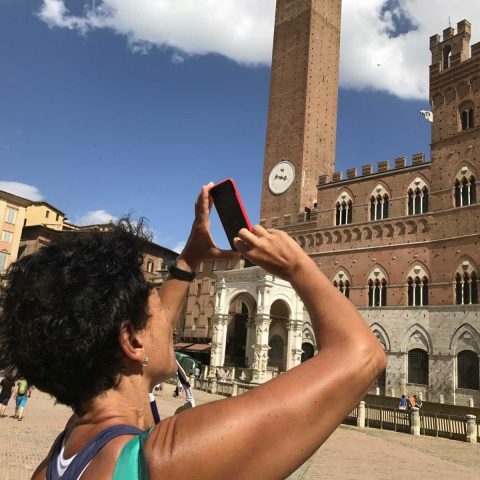 The day started with a drive to Castellina in Chianti, a small town of about 2,800 people who “wake up around 10 a.m.,” Piero said. “That’s the life!” said Tushar, another member of our group. Slowly, all those sepia-toned images in movies of a happier, simpler life in Italy begin to make sense. 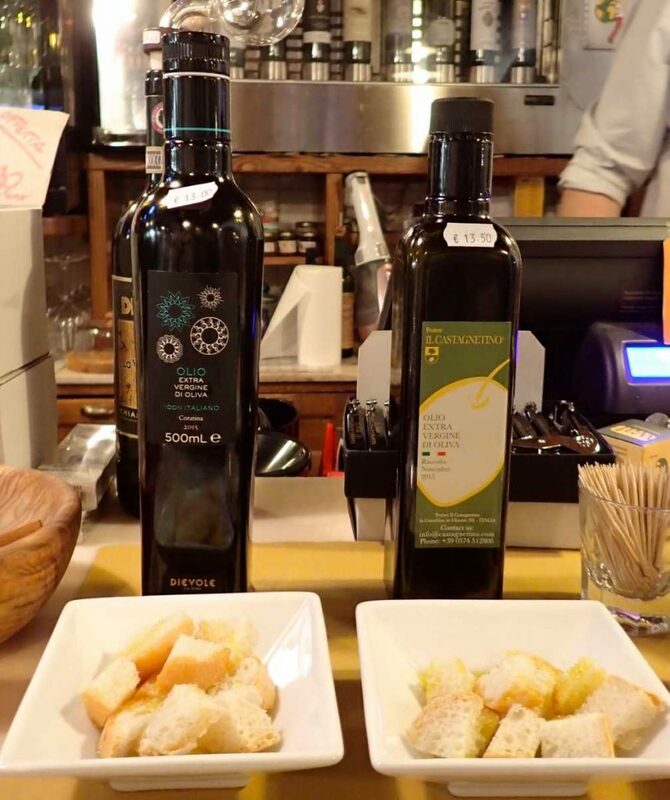 The winery we visited was Enoteca Le Volte, a charming shop filled with wines and olive oils and kitchen accessories made from olive wood. It made us want to sit down and start eating and drinking right away! Full disclosure here: neither of us had ever done a wine-tasting before. Plus, Rob doesn’t even like red wine! But we booked at the last minute and couldn’t do a cycling-only tour, so we settled for the cycling and wine. 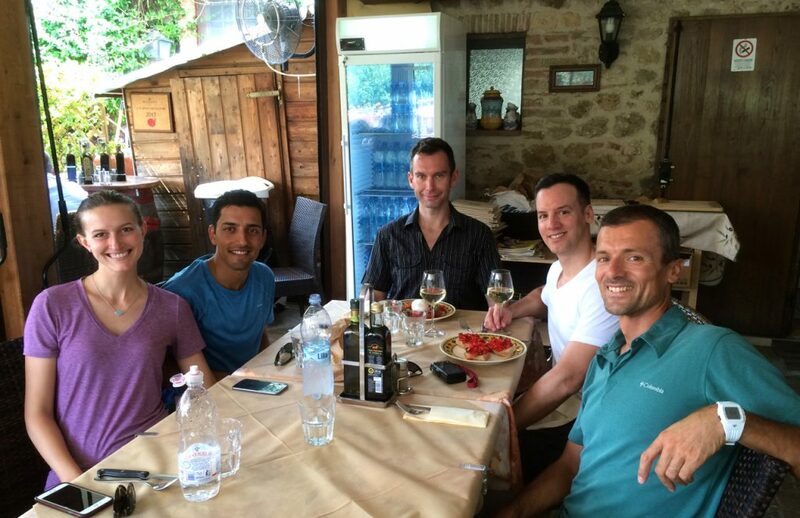 Yeah, yeah, we had to “settle” for the wine in Tuscany, haha. But you know, when in Rome, right? 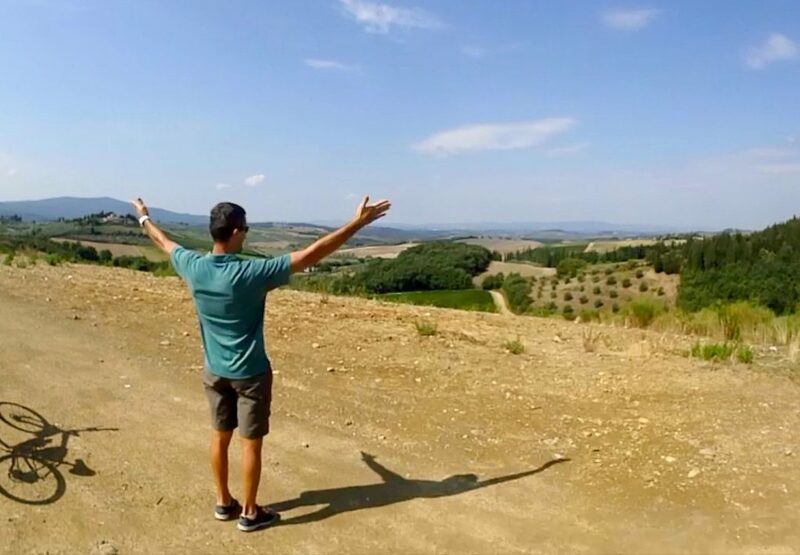 Er, Tuscany! But Rob was actually hoping there was a tour that involved cycling and olive oil-tasting because he loves it. Like, really loves it. Like, to an embarrassing degree, such that you don’t want to admit you know him because of the uncomfortable sounds he makes when eating it. So before we even got to the wine-tasting, Rob dove into to the bread and oil. “Uh, you know those toothpicks are there for the bread,” Bryan said. “Oh really? Oh gosh I didn’t even see them!” Rob said, licking his fingers, knowing that we’d be bringing home the bottle on the right. Jilles was our wine guide and began explaining all about Chianti (any wine produced in the Chianti region, in central Tuscany), the red Sangiovese grapes (Sangiovese derives its name from the Latin sanguis Jovis, “the blood of Jove,” or Jupiter, the god of sky and thunder), and Chianti Classico, “the oldest and most genuine area in the Chianti region,” whose wine has to be made with a minimum of 80% Sangiovese and bears the symbol of the black rooster. Big surprise, the wine was amazing. The red wines were so smooth and sumptuous and unlike any we had tried before. We loved the Riserva so much we bought a bottle (their Riserva is aged two years in a cellar and one year in wood). 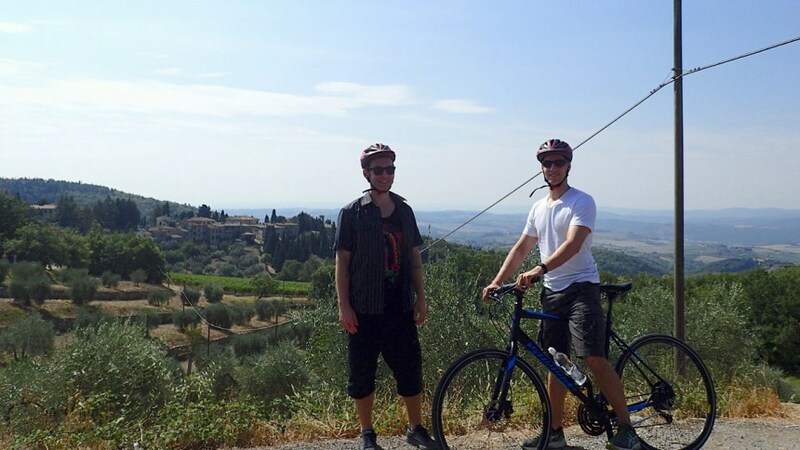 After that, we got on our bikes and headed to the next vineyard, but not before stopping at a couple spots to pause and take in the gorgeous Tuscan countryside. You’ll have to watch our video below to get a sense of riding through Tuscany. Climbing a tough hill and seeing the treeline open to the vast countryside is truly breathtaking because you just climbed a tough hill. Also, yes, it’s so beautiful and peaceful. Piero told us not to worry of passing cars because they’re so used to cyclists, and indeed, they gave us lots of room and didn’t speed by like a Jersey cabbie trying to beat you to the Lincoln Tunnel. 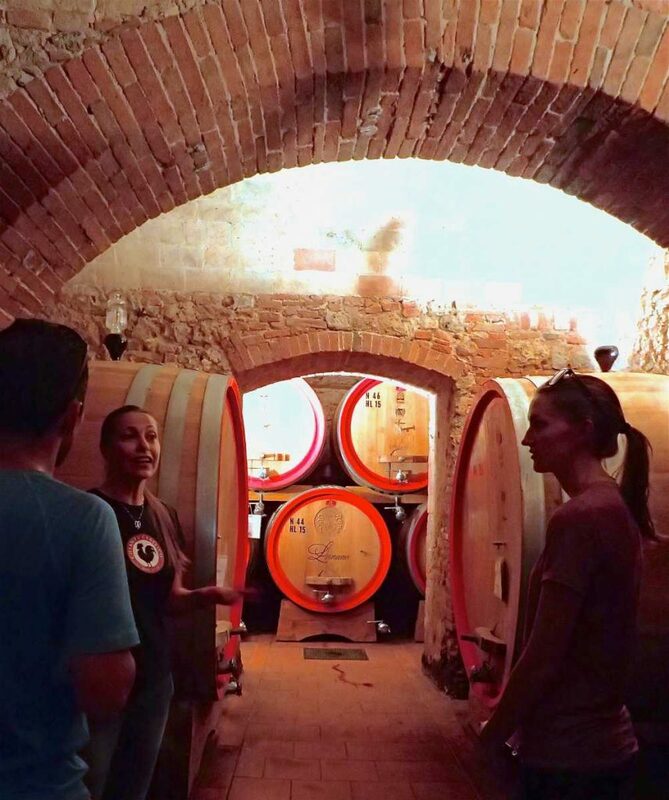 We soon turned into the gorgeous, century-old Lornano winery and estate and were met by the enchanting Angioletta for a tour of their concrete and stainless steel tanks and french oak barrels storing wine produced from the grapes grown in their own vineyard. 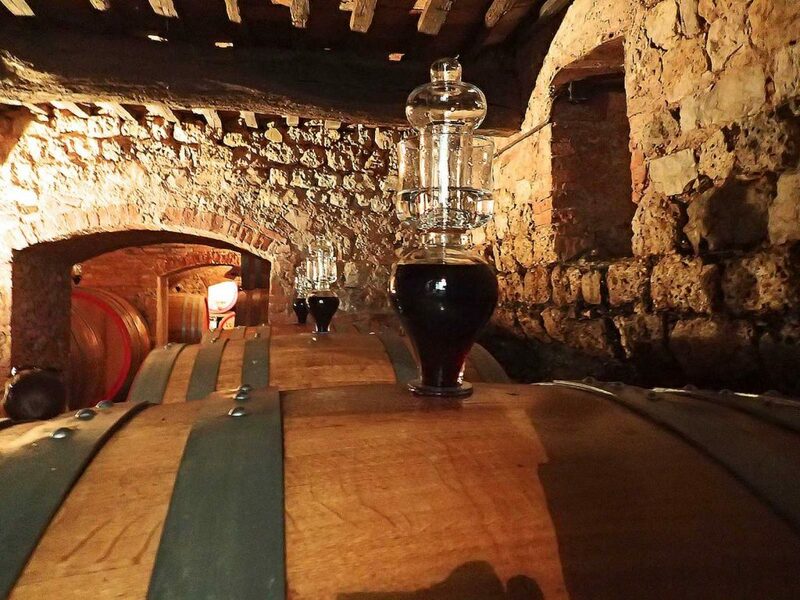 She also informed us that Leonardo da Vinci invented the airlocks on top of the barrels that are responsible for proper aeration of the wine and to easily see that the barrel is still completely full (to prevent oxidation). We’re always learning of things he invented! And you’ll see in the video the moment Angioletta pours the nectar that is olive oil over some freshly cut bread for us. Rob dove in like it was the last supper. 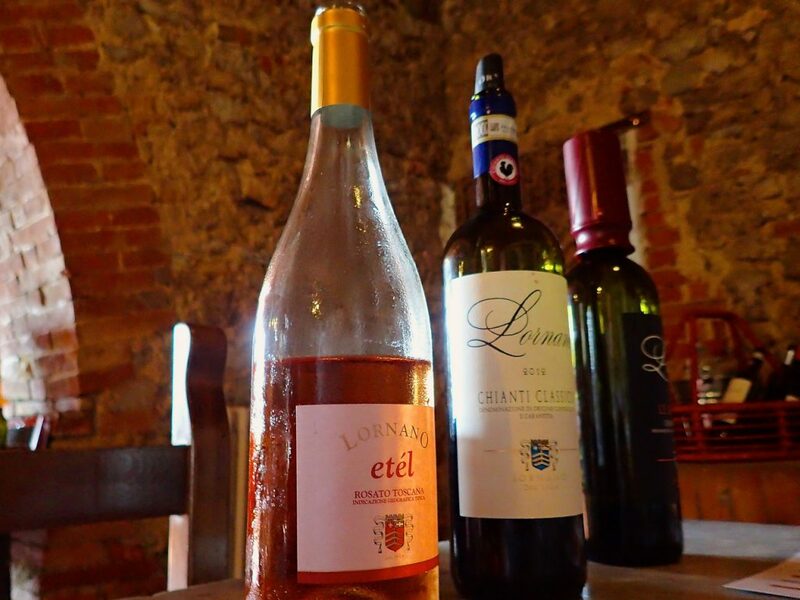 Lornano is a really special place to put on your list if you’re in the region. They even have accommodations and a pool! 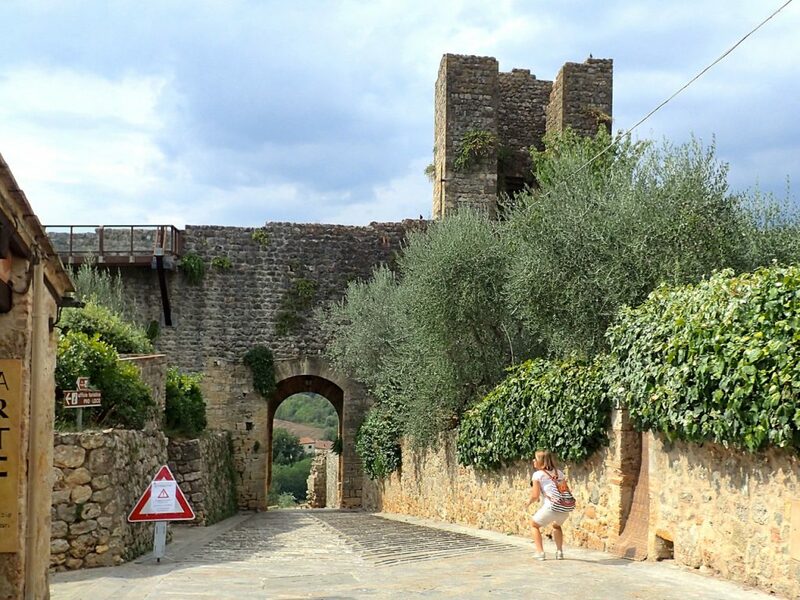 Soon it was back on our bikes to go to our last stop: the tiny, walled, medieval town of Monteriggioni. Construction began in 1213 on the castle and has remained mostly intact ever since. With a wall just 570 metres around, its population today is just 52. 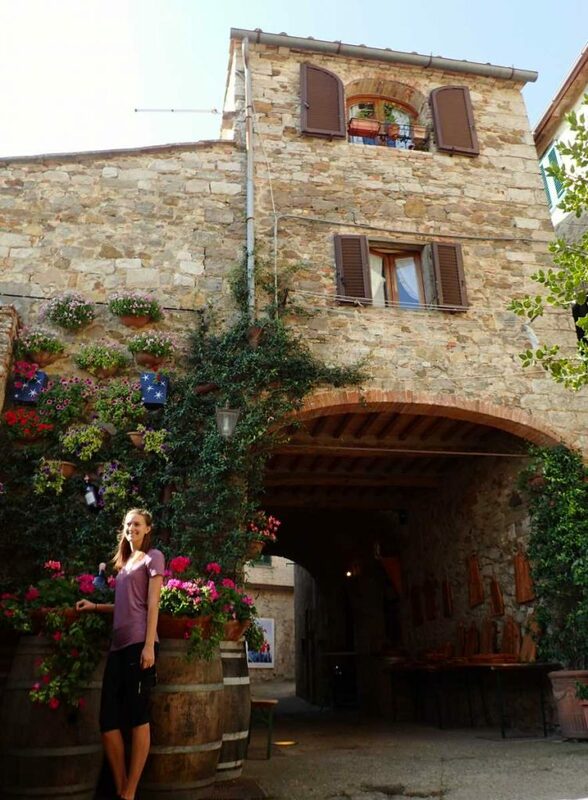 What a jewel in Tuscany! 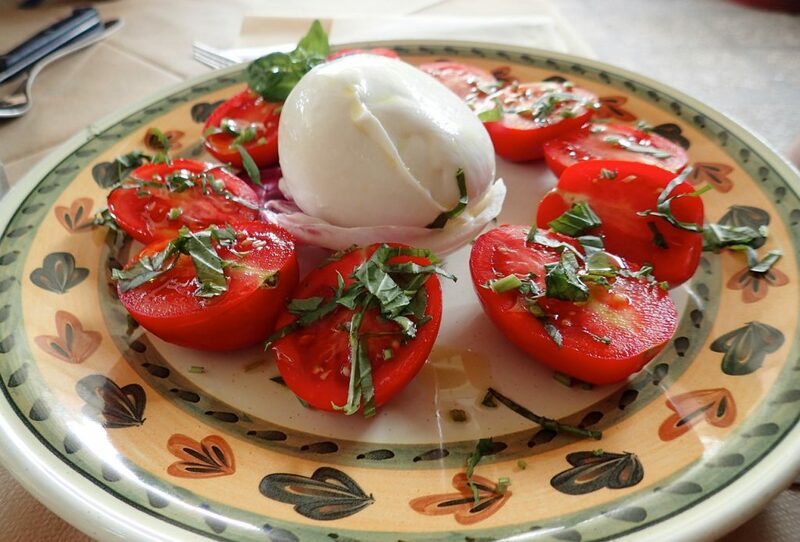 Before the tasting, we had lunch at Antico Travaglio and had THE best tomatoes we’ve ever had. Just look at how red they are! 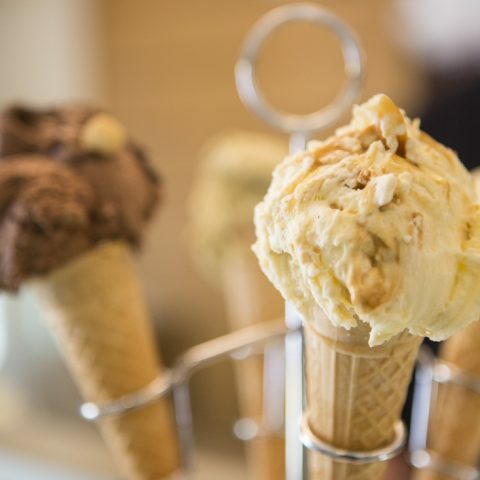 Incidentally, they also happened to have the best gelato we had ever had in all of Italy! Between the food, the wine, the ambiance, and the great company of Piero and our new friends, Tushar and Lauren, we didn’t want to leave. 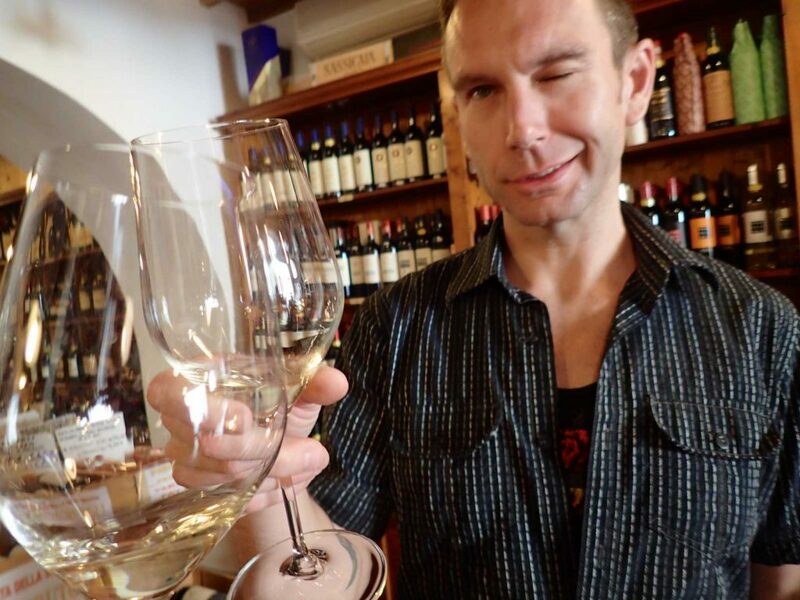 Then we remembered we had another wine tasting, and we were like, let’s Usain Bolt outta here! 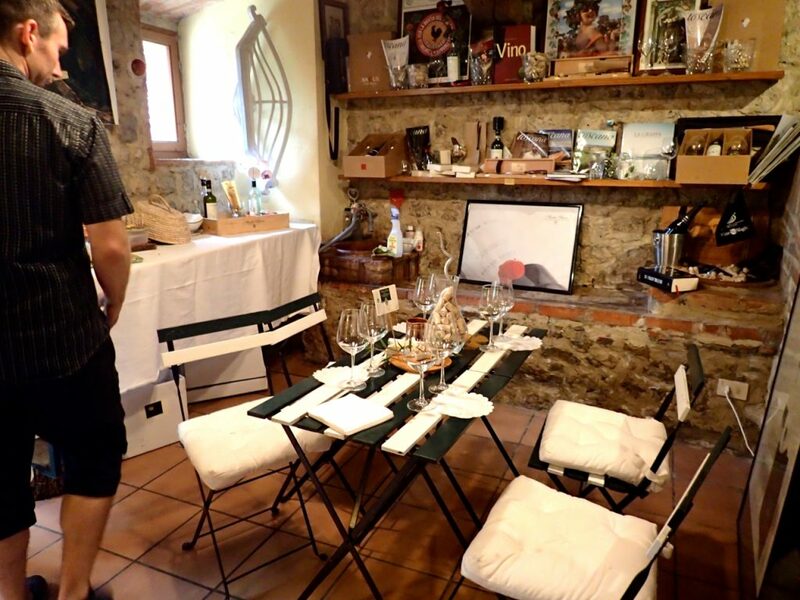 At La Cantinetta Di Monteriggioni, we were beautifully hosted by Seila and Marcella. Just look at the lovely setting they had prepared for us below! And in the middle? Olive oil, woo hoo! 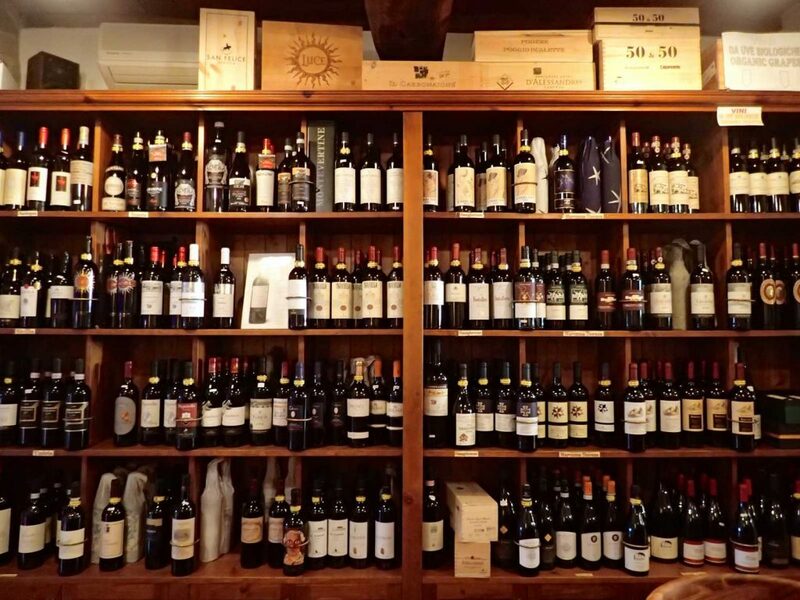 We continued to learn more and more about Tuscan wines and, therefore, fell more and more in love with them. Here they make a delicious brand of wine called Arteliquida that “bounds together a french vine, Viogner, with tuscan vine Malvasia and Trebbiano.” We enjoyed a bottle of it later that night! But alas, all good things must come to an end. We were in such great spirits that they had to keep reminding us that it was over as we just kept chatting in their lovely winery. So off we went to Piero’s van for the drive home, and thankfully so because after the tastings AND the wine at lunch, I’m not sure we could get back on the bike! Thank you so much, Piero, and everyone at all the wineries we visited. 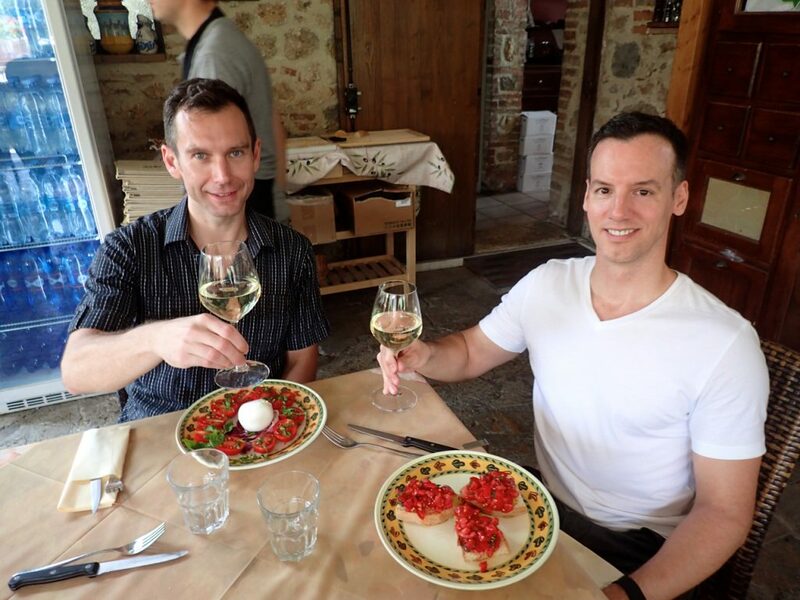 Enjoy our video below and please let us know if you have any comments or questions, and what wine tours you think we should go on next!